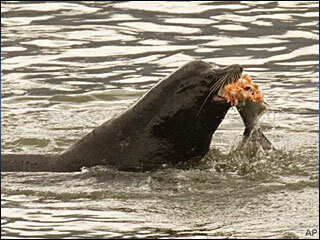 The federal government reversed itself on Tuesday and withdrew permission it had granted to Oregon and Washington state to euthanize sea lions caught gobbling endangered salmon on the Columbia River. The turnaround by the National Oceanic and Atmospheric Administration (NOAA) came two months after the Humane Society of the United States filed suit challenging federal authorization of sea lion killings at the Bonneville Dam. Tuesday's move appeared to settle little in the protracted clash between sea lions and salmon, as NOAA left open the possibility of changing its mind again. "We're delighted the agency has changed its mind and revoked the states' authorization to kill hundreds of native sea lions for having the audacity to eat fish for dinner," Humane Society lawyer Jonathan Lovvorn said in a statement. The two states had already agreed to suspend further killings of the hungry pinnipeds through this summer. The states contend that California sea lions, which swim 140 miles upstream from the Pacific Ocean to gorge on salmon and steelhead trout at the Bonneville Dam, are a threat to the recovery of the fish. But the Humane Society has argued that other factors, such as commercial and recreational fishing and barriers posed by hydroelectric projects, inflict far greater harm and could be better regulated to protect salmon moving upriver to spawn. Columbia River basin Chinook salmon and steelhead have been protected under the U.S. Endangered Species Act since the early 1990s, when their numbers were declared to be perilously low. The estimated number of salmon and steelhead eaten by California sea lions has risen steadily, peaking at 5,000 last year, according to the NOAA's National Marine Fisheries Service. The problem occurs primarily between early April and late May, during the height of the spring Chinook run.